Father's Day in the future will look like this!! Our boy is way too young for this, but I love how simple yet pretty it is!! I don't care if Chris doesn't really use paper, we're definitely doing this project in few years. 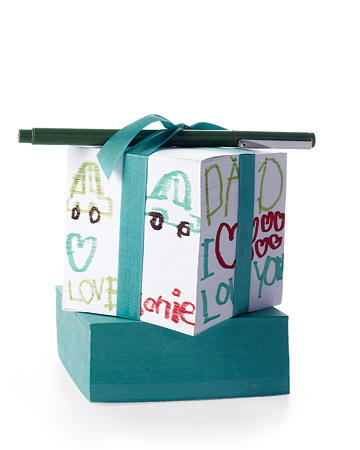 From Martha Stewart: Let kids redo this basic office staple as a gift for Dad -- their messages will last well beyond Father's Day. Sources:Blank note cubes, $4.95 for three, from Oriental Trading, 800-228-2269 or orientaltrading.com.